Great saving on rail travel. You now need a passport photo when applying. 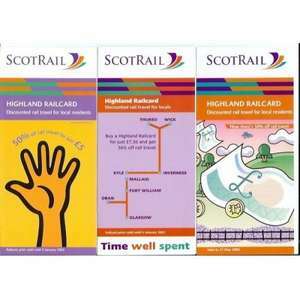 The Highland Railcard costs £8.50 and is valid for 12 months. You can take up to two children with you for a flat fare of £2 return each when you make a journey on your Highland Railcard. Yes only available at above post codes. If you have kids to take on the train in Scotland. it's worth noting that the 'Kids go Free' offer is on again, where you can take up to 2 kids per paying adult for free with an off peak day return. Covers travel anywhere in Scotland.